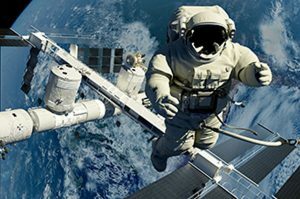 An astronaut who is going to help build or learn how to fix the International Space Station (ISS) faces a multitude of challenges and obstacles he or she must train for before launching into space. This includes learning how to move around and using tools in an enormous space suit with bulky gloves. They begin their training in a pool that simulates weightlessness. Inside, there is a model of the ISS where they spend seven hours underwater for every hour they’ll be spacewalking on a mission. In order for the astronauts to have a true space simulation, they can’t be the only ones with neutral buoyancy – all the assembly components must have neutral buoyancy as well. But how do you make hundreds of pounds of heavy, metal equipment float? That’s where we come in. Our hydrostatic and pressure-resistant LAST-A-FOAM® R-3300 Submersible Series provides permanent floatation for the assembly components. The foam, which can withstand 300lbs per square inch over a 24-hour period submerged in water, is a perfect fit for this application. It’s resistant to water, gasoline, and oil, and has good adhesive qualities that allow it to be bonded within the construction of the submersible vessel. While supporting training operations for the ISS is important, the applications don’t stop there. The R-3300 is frequently used for underwater pumps for offshore drilling rigs, to fill in around electronic housing and computer controls, and for underwater robotics to inspect, measure, and maintain submerged components. There is somewhat of a price/density correlation because you need more material to make a heavier foam. However, we also see a trend in the industry that a lightweight foam with long durability for application use can convey value because the ultimate goal is to lightweight the operation. The lighter the foam is with the necessary buoyancy force, the better it is. Because we can machine our materials to exact specification, we calculate the best value to the customer. Do you have underwater applications that could use polyurethane foam? (You don’t have to be an astronaut!) Give us a call and we’ll talk more about how the LAST-A-FOAM Submersible R-3300 could fit your needs.